Sai Home Appliances is a Mumbai based company engaged in the manufacturing of wide range of quality stainless steel kitchenware. Today Sai Home Appliances is known for the quality and versatility of its product. People associate innovation and value addition with this brand. 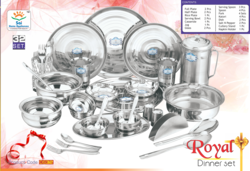 Sai Home Appliances exclusive range of kitchen/serve ware sets reflects its commitment to quality and its desire to give its esteemed customer value for their money. 1)This dinner set is ideal for serving a family of 6 people. 2)Contemporary minimalistic design to suit your taste, giving an elegant look to your home. 3)The glasses can be used to serve cold drinks, lassi, sharbat. This set acts as a perfect gift for weddings, anniversaries. 4)An excellent choice if you are redoing your kitchen or want to replace your current dinner set as you get matching serving and dessert set along with it. 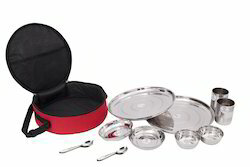 1)This dinner set is ideal for serving a family of 2 people. Strong construction: The Katori is strong in construction and will not bend or have dents during normal use. 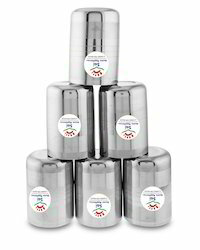 Superior quality: The Katori is made from superior quality of stainless steel. 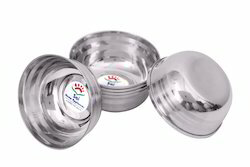 Food grade quality: The Katori used is totally of food grade quality which means its safe to use these utensils for eating. SAI HOME APPLIANCES is a Mumbai based company engaged in the manufacturing of wide range of quality stainless steel kitchenware. 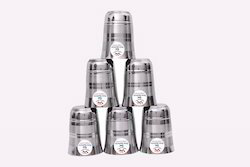 Strong construction: The dinner set is strong in construction and will not bend or have dents during normal use. 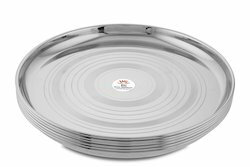 Superior quality: The dinner set is made from superior quality of stainless steel. Beading on the ends: All the bowls have beading on the edges reducing the sharpness & preventing it from getting bent or shapeless. 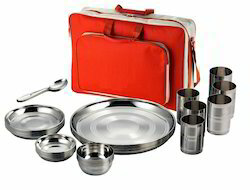 1)This dinner set is ideal for serving a family of 5 people. 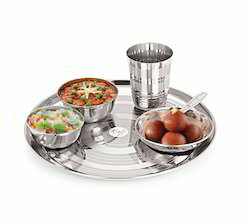 1)This dinner set is ideal for serving a family of 1 people. 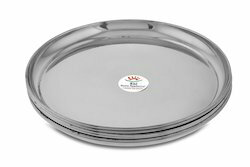 Owing to the constant support of our experienced professionals, we are able to come up with Khumcha Plates. Made at our sound production unit utilizing quality-assured steel, offered plates are in-sync with the contemporary trends of the industry. Post production, our professionals check these plates so as to ensure their defect-free nature. Leveraging on the support of sound infrastructure, we are able to manufacture, supply and export a broad array of Small Stainless Steel Plates. The demand of offered steel plates is at peak as these are manufactured by making use of the quality-approved steel and latest technology. Prior to dispatch, we make these steel plates undergo a quality check so as to ensure their flawlessness. Provided steel plates are also known as Plain khumcha. Silver touch: silver touch finish. 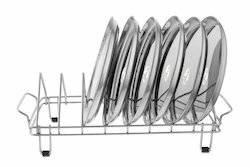 Our esteemed clientele can obtain from us a highly desirable range of Plate Racks. These are quite popular in domestic and international markets for their optimum design and functionality. Furthermore, these can be easily erected on the walls for placing glasses, plates and saucers away from children's reach.